19 September - Learn how to reach out to the right audience, with the right message, at the right time. I have worked on email marketing campaigns in the past that included the subscriber’s first name in the subject line. The open rates on these campaigns were always much higher than the same message sent with a generic subject line without personalization. At the time, there was a lot of discussion about the reason behind it. One thought is that the person who has provided their first name was more interested. A warmer lead. Another thought is that people are excited to see a message sent directly to them. I believe it could be both of these combined. Maddy, Don't Wait! Order Now And Make No Payments For Up to 12 Months! The exclamation marks and overall feel may have landed this message in junk folders. When I saw this in my inbox, my first name jumped out at me and was intriguing enough to get an open out of me. Much like my thoughts on using questions in the subject line I would urge the use of first names in subject lines sparingly. Overuse will cause your subscribers to ignore your message. Could the best subject line ever be a “Personalized Question”? If you have ever tried this tactic, I would love to hear about your results. The Email Experience Council today announced that the holiday email marketing season for retailers has begun. Along with the announcement, the EEC released “Ring-Cha-Ching, Hear Them Ring: The Guide to Gearing Up for the Holiday Email Season,” a 15-page report that discusses retail email marketing trends and practices from the past holiday season. It offers specific ideas, examples, and results from last years’ holiday campaigns by some of the largest retailers in the online space. Last year major online retailers increased their email volume by 47% on average during the holiday season. Seven of the eight biggest retail email volume days of the year occurred in the weeks before Christmas last year. Those days included Cyber Monday (Nov. 27) and all three “Echo Mondays” (Dec. 4, 11 and 18) — the Mondays that follow Cyber Monday. Interestingly, two of the three Echo Mondays were bigger email days than Cyber Monday, which is billed as the biggest online sales day of the year. Email volume should peak in the second week of December this year. Twenty-nine percent of major retailers promoted e-gift cards in their emails during the eight days ending Christmas Day. Just as some online and multichannel retailers promote Thanksgiving Day sales to get a leg up on offline competitors whose stores are closed on that day, some will also begin their post-holiday sales on Christmas Day and promote them in their email campaigns. The guide can be purchased for $99 by visiting the EEC’s Whitepaper Room. 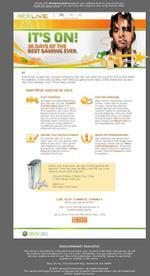 ISPs Are Starting to Perform SPF Checks, Are You Ready? A study released today revealed that marketers should begin attending to Sender Policy Framework (SPF) authentication to improve e-mail deliverability. For the first time, according to a statement from Stefan Pollard, director of consulting services at EmailLabs, SPF checks are becoming part of content filter tests done by Internet service providers. These checks, which compare the sender’s return path domain and the IP address to a list of approved IPs the sender includes in their DNS zone, are often failed because a company changes IP addresses or e-mail service providers, and doesn’t update its SPF records. The Lyris’ EmailAdvisor ISP Deliverability Report Card for Q2 2007 measured the delivery path of more than 436,000 permission-based e-mail marketing messages using ISP domains in the United States, Canada, Europe and Australia. Increased attention to SPF ratings requires marketers to ensure that their SPF records are current in order to maintain delivery rates for permission-based messages. SPF record maintenance is not something done automatically by ISPs. But failing an SPF check can carry double the spam-rating penalty compared to the other Top 10 spam triggers identified in the study. Check out also this overview of authentication resources on Mark Brownlow's blog. "Many major content filters rate messages according to how many elements in them are commonly associated with spam, such as copy, format, coding, and headers. A content filtering system doesn't automatically flag a message because it contains one or two words associated with spam. Instead, a system like SpamAssassin runs hundreds of tests on a message, searching for spam-like elements. When the system encounters one, it assigns a point value, from a fraction for a suspect word to several points for major infractions, such as being blacklisted. If a message accumulates too many points, the filtering system flags it as spam. Just how many points it takes to cross the threshold depends on how the filters are configured at the destination. Some are set very low, with three to five points being all that's needed. Others are more liberal. Using "free" in a subject line or "click here" in the body may add a fraction of a point to a total content score, but if other e-mail elements are in good order, the message shouldn't be flagged as spam. How concerned should you be about content filtering? Most of the time, major portals such as Hotmail, Yahoo, and AOL rely more on the sender's reputation than on message content. Even if content scores high with the filters, a good reputation should help messages get to an inbox. Most corporations rely on content filters to block spam. Thus, content plays a larger role in business-to-business (B2B) message delivery. You know your market segments. Analyze domain names in your e-mail address database, and you'll see your major destinations." A welcome email should come immediately after sign-up. It should thank users for opting in, explain what they can expect from your email program and get them excited to receive the next one. Personalization - Starting off your relationship with a personal tone is key to driving great experiences and a good first impression. Utilize as much known information as possible. Benefits of Sign-Up - Highlighting the benefits of your email program and creating a sense of exclusivity can make your customers feel part of a privileged group. Highlight these benefits and exclusive offers via bullets or call-out boxes within your creative to make sure they are noticed. Welcome Offer/Prominent Calls to Action - Providing a special welcome offer can immediately make users feel special. Additionally, it's important to get the user to make that first purchase - so anything you can do to get them over that first hurdle will pay off in the long run. Include clear and prominent calls to action throughout your email. Don't go overboard but make sure it's clear to people who want to make a purchase exactly how to do so. Easy Navigation/Site Introduction - The welcome email can introduce users to your site navigation (via header navigation that is consistent with your site) and also encourage them to click through and explore your site on their own. Utilization of HTML - Use this message to introduce people to your brand's look, feel and voice. Tapping Into the Subject Line - If possible, include your welcome message and offer into the subject line. Account Confirmation - For some, it makes sense to confirm certain aspects of a user's account. A welcome email can be a good vehicle for this. You should encourage users to save the email in order to access this account information in the future. Read the article here and find some good examples across the industry. Will Suspect Words Get You Filtered? It depends! Loren McDonald (JL Halsey) says content CAN get you filtered, but it is more likely going to be a combination of several words, phrases, not passing SPF tests, using bad code, etc., then combined with your reputation scores…. reputation problems with the server sending the email: high complaint rates, unknown user rates, spam trap hits or bad sending infrastructure make the IP or domain sending the message look bad to the receiver. Josh Baer (Skylist) says it’s worth noting that each ISP is different and while the big ones are more advanced, others are often still archaic. They may be using outdated tactics or old versions of software like SpamAssassin instead of the latest version. Ray Everett-Church (Habeas) concurs: "Unfortunately many smaller ISPs and untold thousands of businesses are still using filtering/blocking technologies that can only be charitably described as archaic and/or ham-handed." Yesterday Bronto's DJ Waldow pointed a fellow member of the Email Marketer's Club to a page that contains guidelines for email marketers to get their emails delivered in the Gmail inbox. Use a consistent IP address to send email. Use the same "from" header on every email you send. Keep valid reverse DNS records for the IP address(es) from which you send email and point them to your domain. Publish an SPF record and sign with DomainKeys. Provide a 'List-Unsubscribe' header which points to a web form where the user can unsubscribe easily from future mailings. Gmail does not accept 'whitelisting' requests from bulk senders. If you are sending mail in accordance with their guidelines and Gmail continues to mark your messages as spam, you can contact the Gmail Team. According to a Direct Magazine survey of DMers concerning the online practices scheduled to come out in September's issue, 14% of traditional business-to-consumer DMers say they send marketing emails to people on an opt-out basis. "And it's not just fly-by-night direct marketers that are spamming. I personally have received unsolicited e-mail from Circuit City, Kmart, Colgate-Palmolive, Williams-Sonoma, Plow & Hearth and, of all things, Smithsonian magazine", Ken Magill says. The sad thing is that this practice is even legal in the US (except for some states like Utah). But let's be clear: even if it's legal, that doesn't mean that it's the right thing to do! How do you feel when you receive an email in your inbox that you did not sign up for? Do you "report it as spam"? I know I do. I have zero tolerance for emails that arrive in my inbox without me requesting them -- unless they are highly relevant to me. So be careful: by running your email program on an opt-out basis, you risk having high complaint rates at the big ISPs and that will serious impact the inbox delivery of your future emails. Keep in mind: ISPs are under no obligation to deliver your emails. Source: directmag.com via The Email Wars. Peter Kim, an analyst at Forrester Research in Boston, created a top 20 list of marketing blogs called The M20: Top Marketer Blogs. The blogs on this list are all blogs that are written by corporate marketing professionals. And I'm proud to say that this blog is ranked #4! Peter will update this list on a monthly basis. It's part of human nature that makes us helpers. My kids are always asking if they can help cook dinner, wash the car, and put away groceries. Why? Because it makes them feel good to help. It's no wonder when I saw the subject line in a message from Chadwick's today I immediately opened the message. "Please help our design team & get $20 off". 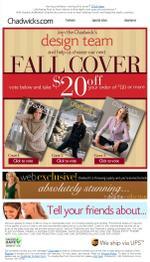 By voting on my favorite cover for the upcoming fall catalog I can get $20 off my order of $80 or more. I clicked on my favorite and received the code. The message on the landing page said "Look for your new Fall catalog in the mail"
This is a great multi-channel approach that really engages subscribers. Now I have an opportunity to save if I order between now and August 27th and I will be paying close attention to my traditional mail over the next several weeks to see if the cover I selected was the winner. And, I'll probably make another purchase then too. 12 September 2pm ET - This webinar will discuss what relevance in e-mail marketing is and how to achieve it. The eec will be holding its first annual event - the Email Evolution Conference - February 11-13, 2008 in San Diego, California. Stay tuned for more information on this event coming in the next few weeks. Am I Being Overly Paranoid About Spam Filters When Writing My Subject Lines? Read what the industry experts have to say on the subject of content filtering. 1-2 November. EMSA 2007 is Australia's first dedicated email marketing summit. PetSmart sends a message each month promoting ways to save money with their PetPerks Program. I received their latest message last night. And after reading about the personalized email marketing messages from Columbia Sportswear I realized that PetSmart wasn’t doing the best job of speaking to their subscribers. The message that landed in my inbox had "Specials for Dogs", "Specials for Cats", "Specials for Fish" and a "Grooming Special". Here's the problem with that. I have two short-haired dogs. No cats or fish and those short-haired dogs don't go to the groomer. Three quarters of the advertised specials don't apply to me. Had PetSmart asked for my preferences they would know that I'm not interested in cats, fish, grooming, hamsters, snakes or anything other than dog products. And with only a way to unsubscribe, rather than update my preferences, PetSmart may never know that while I'm interested in receiving messages from them, I don't really care about their "Specials for Cats". By using subscriber preferences combined with a dynamic content strategy, PetSmart could send highly targeted messages that would speak to each individual subscriber. Plea to Citibank: Stop Emailing Me! See how a well-known bicycle maker combined a smartly designed email and directed traffic to a microsite to achieve the biggest product launch in their three-decade history. Aug 29 @ 10am PDT - 3 email marketing veterans will discuss methods for promoting the visibility of email marketing within your organization.